Barbara Scowcroft has been a member of the Utah Symphony violin section since 1982. She served as Acting Assistant Concertmaster in the 2008-2009 and 1998-1999 seasons. In 1986, Barbara and Utah Symphony Music Director Joseph Silverstein co-founded the Utah Symphony Side-by-Side with Utah Youth Symphony program. From 1980-1985 Barbara conducted the University of Utah Chamber Orchestra. This year - 2014 - marks Barbara’s 28th season as Music Director and Conductor of the Utah Youth Symphony Orchestra. On the Utah Symphony’s Alumni Salute to Youth Concert in 1991 she conducted Saint-Saens’ Carnival of the Animals. Barbara served as the Music Director and Conductor of the Vivaldi by Candlelight Concerts at St. Mark’s Cathedral, 1997-2004. At the Grand Teton Music Festival in Jackson, Wyoming, she has conducted works for Chamber Ensemble on the Festival’s chamber music series and presents pre-concert lectures. Since 1999 she has been conductor of the annual String Fest – a week-long clinic for Jackson and Star Valley Middle School youth orchestra musicians. She was Music Director and Conductor of the World Youth Orchestra for the Cultural Olympiad during the 2002 Olympic Winter Games in Salt Lake City. Barbara selected forty musicians from five continents representing twelve countries and combined them with135 Utah Youth Symphony Orchestra musicians to form an international family of youth musicians who traveled together throughout the Intermountain West for the entire month of February 2002 to rehearse and perform several outreach concerts as part of a cultural goodwill concert tour. The month-long cultural exchange culminated on February 18, 2002 free,concert by the orchestra at Abravanel Hall. She was guest conductor for the Guangzhou, China Conservatory Orchestra in 2002. Barbara has also been a guest conductor at the American Festival for the Arts in Houston since 2002 and in 2005 was appointed the Festival’s Resident Conductor. In 2004, Ms. Scowcroft was selected to conduct the Texas All-State String Orchestra. In 2006, Barbara became the first woman to conduct the Salt Lake Symphony and has continued to conduct in 2011 and 2015. 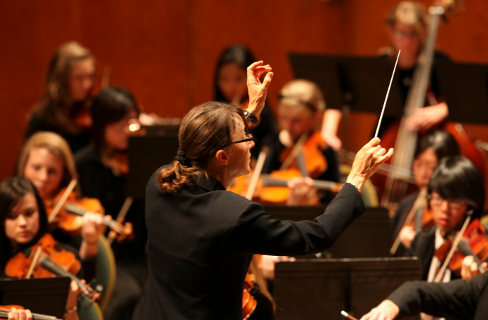 In 2008, in response to an increasing number of youth musicians requesting auditions for Utah Youth Symphony Orchestra, Barbara founded Utah Youth Philharmonic, a second weekly orchestra for talented youth musicians. In 2009 and 2011, Barbara conducted the University of Utah Philharmonia. Barbara was Music Director and General Manager of the Nova Chamber Music Series from 1985-2004. She was a founding member of the NOVA String Quartet, which performed 1982-2004. She received the Governor’s Award for NOVA in 1999. Under her direction, the NOVA Series presented a wide range of classical and contemporary chamber music including numerous works commissioned for the series. Barbara secured The Museum of Fine Arts at the University of Utah as the home venue of the series, reflecting her belief in the fusion of visual arts and music. She co-hosted concert broadcasts of NOVA with Gene Pack on KUER public radio in 1985-1998. She co-created and performed on a special tribute to Joseph Silverstein for KUED public television in 1996. Barbara attended the Motzarteum in Austria, The North Carolina School of the Arts, and the University of Utah, where as an undergrad, she was a founding member of the Honors String Quartet and received a B.A. in music. Barbara completed a Masters of Music Degree in Conducting at the University of Utah in 2003. She is Adjunct Associate Professor of Violin at the University of Utah and has served as guest faculty at Westminster College. Barbara has performed annually with the Grand Teton Music Festival since 1997, in addition to conducting Chamber Ensemble works on the Festival’s chamber music series and presenting pre-concert lectures. She wrote and narrated Stories for Stravinsky’s Firebird Suite with Eiji Oue in 2003 and for Stravinsky’s Nightingale with Max Valdez. In 2011, she began serving on the education committee for the Grand Teton Music Festival. In 1992 Barbara received Salt Lake City’s first Mayor’s Award in the Arts. In 2003 she was awarded O.C. Tanner’s Everyday Hero Award for her volunteer work with Utah non-profit organizations. In 2004 she was selected by the National Association of Women Business Owners, Utah Business Magazine, and the Salt Lake Chamber of Commerce as one of thirty “Visionary Women of Utah”. In December 2011, she was given a Governor's Artist Award. She received the Distinguished Alumni Award from the University of Utah for the 2014-2015 school year.